Winnie & Walter is celebrating World Cardmaking Day with a bang. There's a sale, challenges, and this blog hop. All details can be found here. More than delighted to be part of the Winnie & Walter World Cardmaking Blog Hop. There's some super serious talent here (some of my favorite crafters) and I cannot wait to see what they are sharing. You should have come from the mega talented Nina Marie Trapani's blog. Plus prizes!! 5 random winners in total will be drawn from all the comments left on the different stops along the hop. Deadline is October 13th. Each winner will receive a $25 gift certificate to the Winnie & Walter shop. I've got two cards to share. First up is one of my favorite color combinations -- gold, white, and black. The sentiments and dies are from Winnie & Walter's In Bloom: Frenchy's Festive Florals with Angelica Suarez. And I LOVE this sentiment. The "tree" triangle is cut out of Modern Graphic paper from Essentials by Ellen. It is black and white paper, but I put it through the Minc to add gold foil on top of the black dots. The Joy die is stamped and layered 5 times to get a nice thick focal point. The next card was a snap to make. Fell in love with this simple Noel cutaway die. Used a very bright red cardstock (Holly Berry from Memory Box) to go with the bold typography. The next fantastic cardmaker on the Winnie & Walter blog hop is Vanessa Menhorn. Hope you are able to carve out some time to stamp today! MOOD WHEN DONE = What the heck am I doing as part of this lineup of stampers?? Thanks to Taheerah with Winnie & Walter for inviting me. Haven't done design work in over a year and this was fun. two fantastic cards, Joan - love how you designed the tree card! Both your cards are so fabulous and elegant..Love them !! I really love the typography card! Such a strong impact with a single die! How wonderful to see your creativity showcased in this hop; you've brought us a marvelous duo of delights! 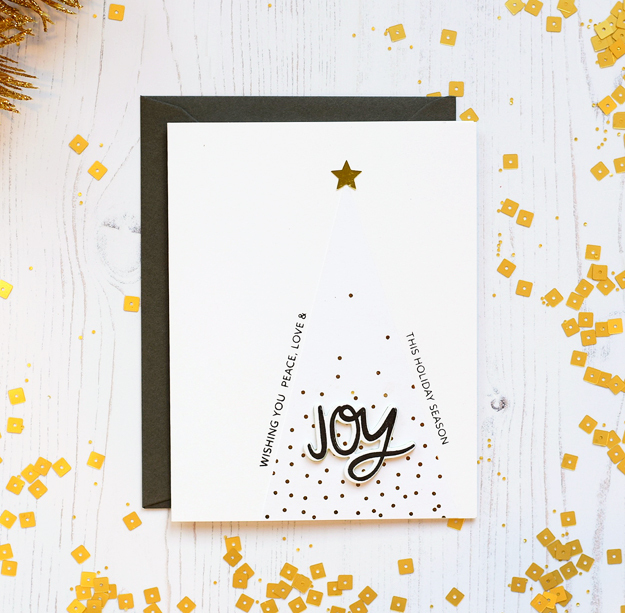 Love your stylish tree (the joy certainly is the star o f the stage) and eye-catching typography card! Very simple and creative designs. You have just proved that simple is beautiful when it's done right! Very nicely done. Thank you. Hmmm... World Card Making Day? Well, gee, if I'd remembered I would have declared it a stamping day. As it is, there are other things on the agenda, but maybe I can carve out some time. You wonder how you wound up in this line up of stampers? It's pretty obvious to me. You've got two fantastically creative cards in your signature CAS style. You used these stamps and dies beautifully! Clean, simple and nice. Not over kill. Your cards are so fresh and alive! Love the playful look of them. Beautifully CAS.... with the perfect bit of dimension (and sparkle)!! Your cards are outstanding, Joan and it is clear why you are part of the hop! ;-) I love how well you do CAS (such a skill)...I would have never known it was a while since you last did design work and sure glad you did. Thank you for joining us for WCMD. Love Your CAS style..Both the cards are simply awesome..
Wow, love the simple gold and black card, but gives a big "wow" punch. I love these cards!!! Fantastic! My kind of cards...clean & simple!! I REALLY LOVE the first card with the foil. I have bought some foiling supplies very recently & can't wait to try them!! Love these CAS cards. That tree is Fabulous. Love the bold colors in the second card! And what a clever use of stamps on the first. Two very elegant cards ! Two awesome modern cards, love them. Great CAS cards, very efficient ! Wow, love your style. Awesome cards, just awesome!! I really like your cards! The subtle and sparse dots on the tree are fabulous! I love this simple style, almost no cost and no supplies, but the wow effect is great! Cool cards and fun to recreate! Thank you! WOW, beautiful holiday cards! So inspiring! Happy World CardMaking Day! Simple but so beautiful. Love! Modern and sleek. I really enjoyed seeing both of your cards. Such cool, clean and modern looking cards. Love the ideas. Thanks! First time to your blog! Thank you for sharing the 2 cards, very nice work & design. Thanks again will be back to visit again!! 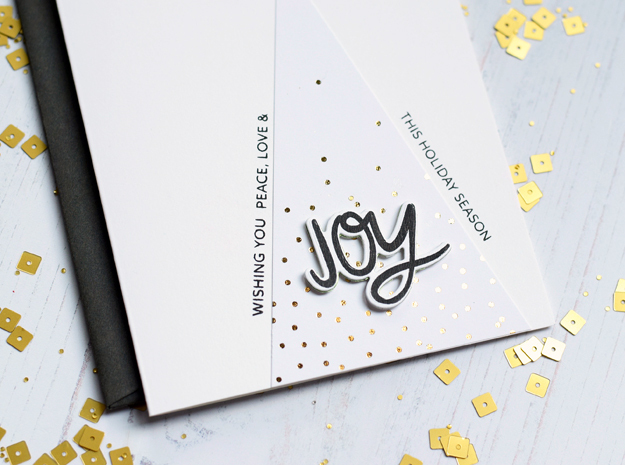 LOVE your repeat "noel" die cuts, ADORE your ELEGANT black, gold & white "Joy", such a BEAUTIFUL design! Great cards. I love the simplicity of the Christmas tree. It's so good to see something different from the traditional cards. 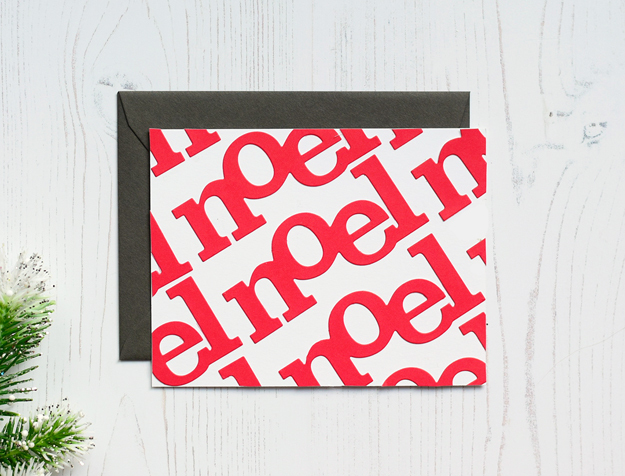 Love Love Love the noel card! simple but packs a punch! Very nice set of cards. Simple but yet elegant. WOW, what great cards Joan! Glad to see you came out of design-retirement for W&W, Joan - really wonderful designs, and execution, too! That subtle little Christmas tree is so darling - you, E.H., and that paper are going to push me over the edge to buy a Minc, Joan! but that would be a very good thing, right? These are both wonderful cards. I hope you will keep creating. Love both fabulous cards!! My fave is the black & white. The simplicity & elegance are awesome? Love your "out of the box" thinking in both these card designs -- very simple yet elegant and very effective!! Thanks for sharing! This is a great release!! Happy World Cardmaking Day! I love the simplicity of your first card. Very creative. Absolutely love these cards. The first one had me reading very carefully to see how you made it. Fantastic, Joan. Two great cards! Very classy Christmas tree design! Thanks for sharing! I love the simplicity of the Christmas card - it's really beautiful! The other card is so bold, just the opposite of the first one! Both are great! Thank you for sharing! Love the beautiful simplicity of these cards. Classic! Fabulous! I've saved then to my Christmas cards Pinterest board! Beautiful cards! Love that tree! Gotta pin it! Beautiful cards, Joan! Love the first one with the tree and the foil accents. Both are perfectly CAS and striking! Less is more..... creative cards. THANKS! Your cards are very modern looking but oh so striking too! :) Good job!! These cards are gorgeous! Love the unique style!! I love the elegance of the first and the graphic nature of the last. I love how you used the star shining down on the first card. It's a wonderful idea! I also love the noel card. I love those Winnie and Walter word dies! They are so versatile! Great take on your two cards. Love the out of the box thinking you did on them. The first card is very elegant and the second is just bold and fun. Always love your cards. And YOU do belong on the list of other card makers on this hop! Cool cards. Love your tree card... simple and stylish. I wish I had a Minc to do the foiling. Fabulous idea. Great card designs. I really like the tree. Love these cards. Simple and stunning. Lovely cards! Loved the tree and the gold on black and white!